Go Anywhere Now In Chattanooga Fast With Millennium. About Millennium Taxi & Transportation. Millennium is available to you when you require transportation to the airport, hotel, a business meeting, tour or another engagement. 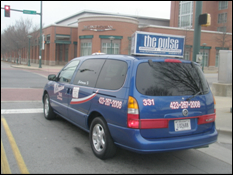 Millennium offers the fastest and safest passenger service in Chattanooga! Our aim is to provide a high quality passenger service for all types of transportation needs at a very competitive price. We have an excellent reputation for courteous and efficient services. Cabs and transportation vehicles are spotless and comfortable. Ready for service 24 hours a day 7 days a week. Customer satisfaction is always guranteed.